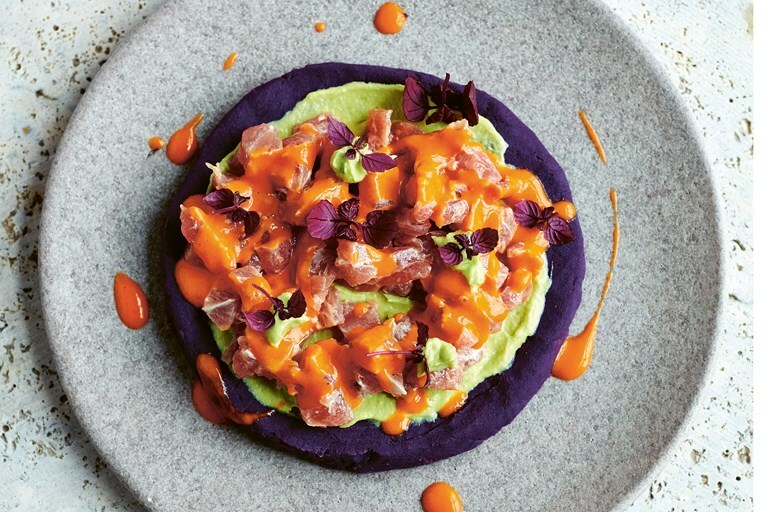 Martin Morales serves up his stunning purple potato causa recipe with a tuna tartare coated in vibrant, delicious rocoto tiger's milk (the acidic, fragrant liquid used to marinate most Peruvian ceviche). This recipe is taken from Andina: The Heart of Peruvian Food by Martin Morales, published by Quadrille. Photography by David Loftus. Causas are cold mashed-potato salads, topped usually with avocado and other ingredients. We love making them, and this one has been a real favourite as a result of its balance of textures, colours and flavours. You can use cooked octopus or any other fresh fish instead of tuna, if you prefer.